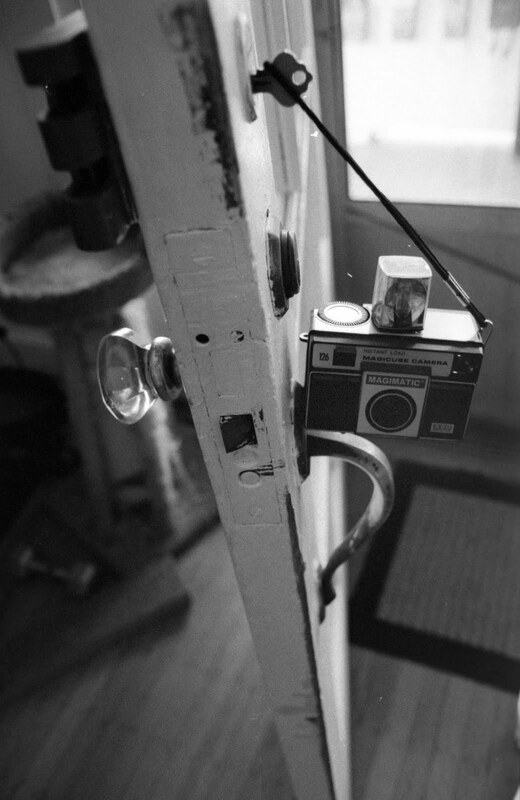 The new shutter release kit for the Holga arrived today and it seems the mystery of incompatibility has been solved. It seems the shutter releases they are selling now have an oblong- shaped cut out (as opposed to a circular one) at the bottom of the attachment which should, I believe, be able to accommodate both kinds of Holga tripod mounts! Yeah! 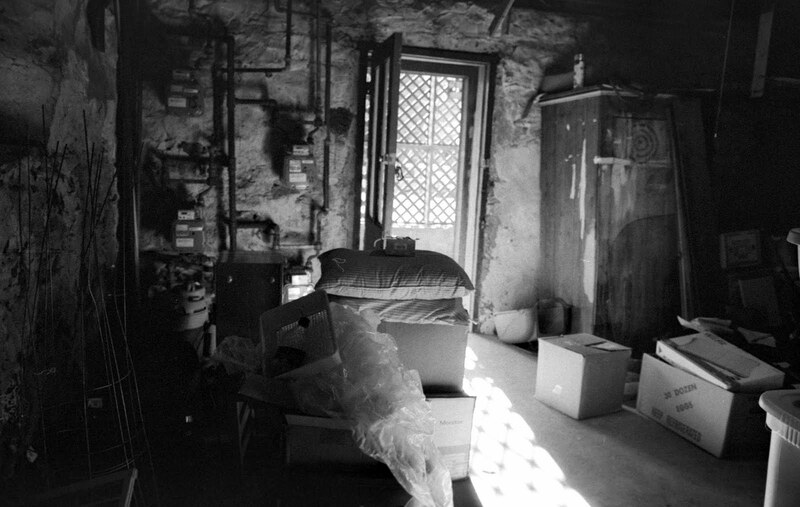 That said, I can finally start thinking about and planning for doing some Holga infrared. Or perhaps more simply, the online descriptions for the cameras and shutter releases might be described specficially as having (or fitting) the centered vs. decentered tripod mount. Holgas aren't expensive, per se, but they ain't cheap. Ditto for the shutter release adapter. Add to the costs, the frustration of receiving an incompatible item and the wait time (and perhaps extra costs for return shipping for items). Blah. Really frustrating. 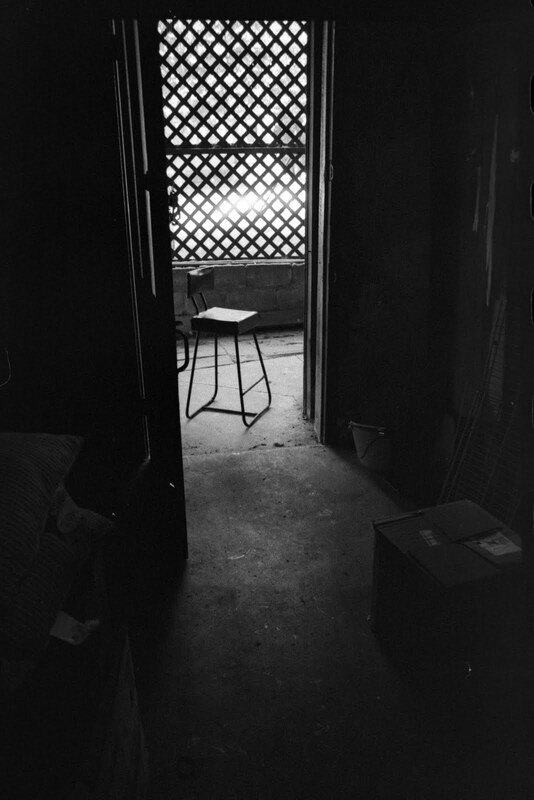 Meanwhile, I'm still waiting to experiment with infrared film in the Holga. 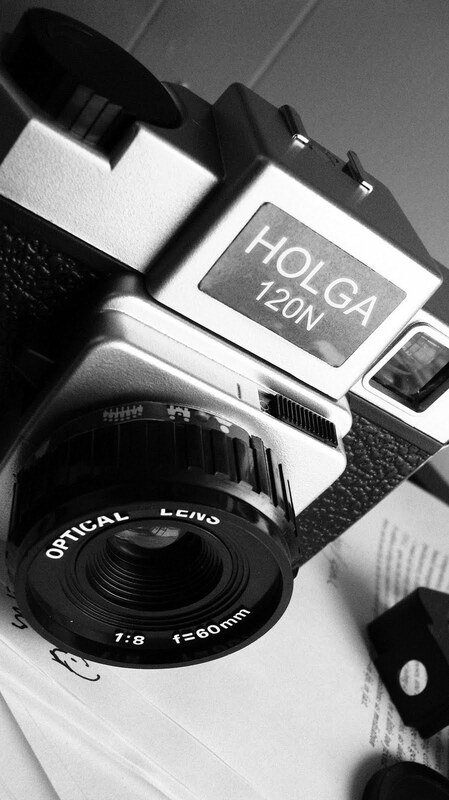 To think that I placed the order for the first Holga on July 12th. And I'm still waiting for the issue to be resolved. Maybe my goal should be to shoot Holga infrared in fall? There were actually only two images that I liked and those appear beneath the coneflower image. On the bright side, the exposures were okay--that's always a concern with the long exposures--that they'll be terrifically under-exposed. 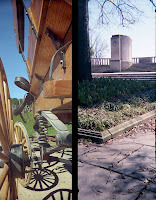 I used fuji 800 color film metered at 400 on my digital cam and then doubled most of the exposure times. Between the 800 speed film and a f/43.5 for the zone plate, exposure times were considerably shorter than they were with the last roll. 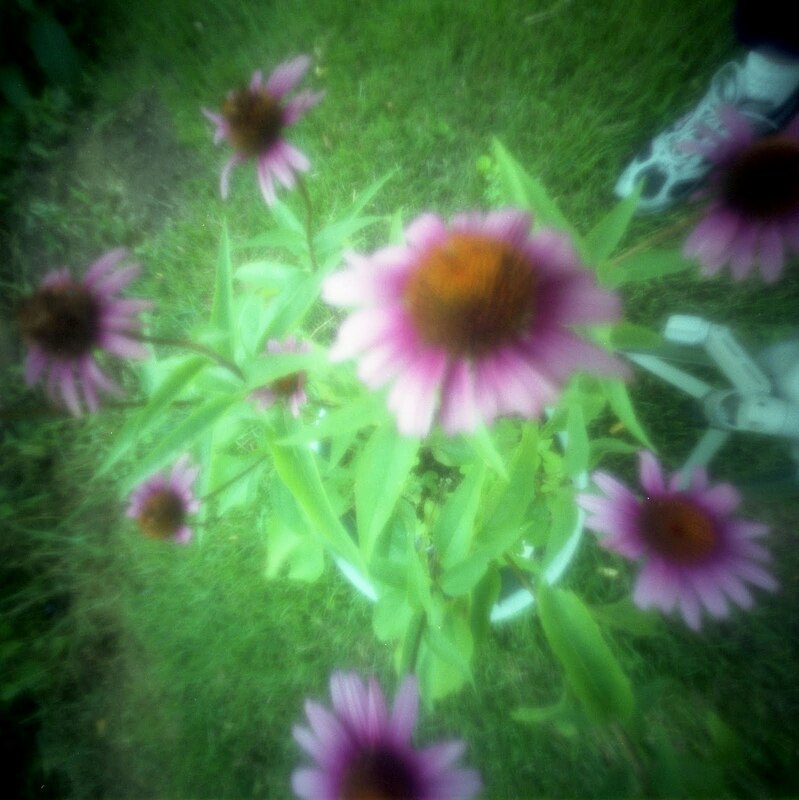 The coneflower image was a 3 sec exposure and the two basement shots were each about 8 seconds if I recall correctly. It's frustrating not feeling in command of what I'm shooting (or not being able to better anticipate results) but it provides me with a challenge. 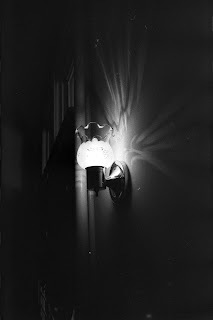 If nothing else, these almost-failures leave me wanting to try something else to see if I can get this camera to do what I want it to do, what I've seen others do with it. . . .but i'm still clearly hung-up on the basement. There's just something about the dramatic lighting and the depth, direction, texture and dimensionality that that light affords. It's that, I think, that keeps me going back there (with a camera, of course) again and again. It had been some time since I ran color film through the Canon AE1 Program so after doing the b/w interior shots, I decided to run some color through. I'm absolutely loving the basement shot featured first here and entitled "blue litter box" but I'm less wild about the shot below, entitled "Blend." To be fair, I would have probably liked "Blend" a lot a few months ago, it's just that with me currently being about seeing all things with (or through) basement lighting, "Blend" strikes me as flat. Then again, to be fair, the purpose or objective behind my taking this image was to see what I could do by way of getting foreground, middle ground and background to blend. 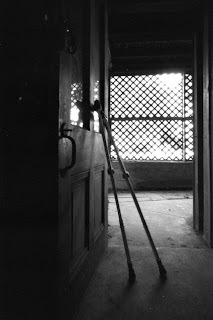 The images below were taken with the Nikon L35 AF. 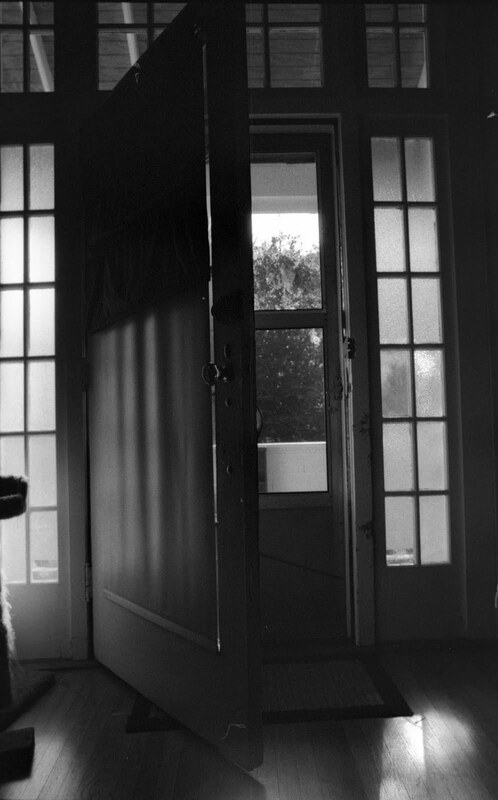 Not bad, really, for throw-away, hurry-up-and-take-whatever-since-the-film-was-probably-already-exposed shots. The camera seems to respond really well to low-light conditions or poorly lit situations. Hmmm. I wonder how it might respond if I took it to a place I know of where the light is simply super-duper dramatically amazing. . . 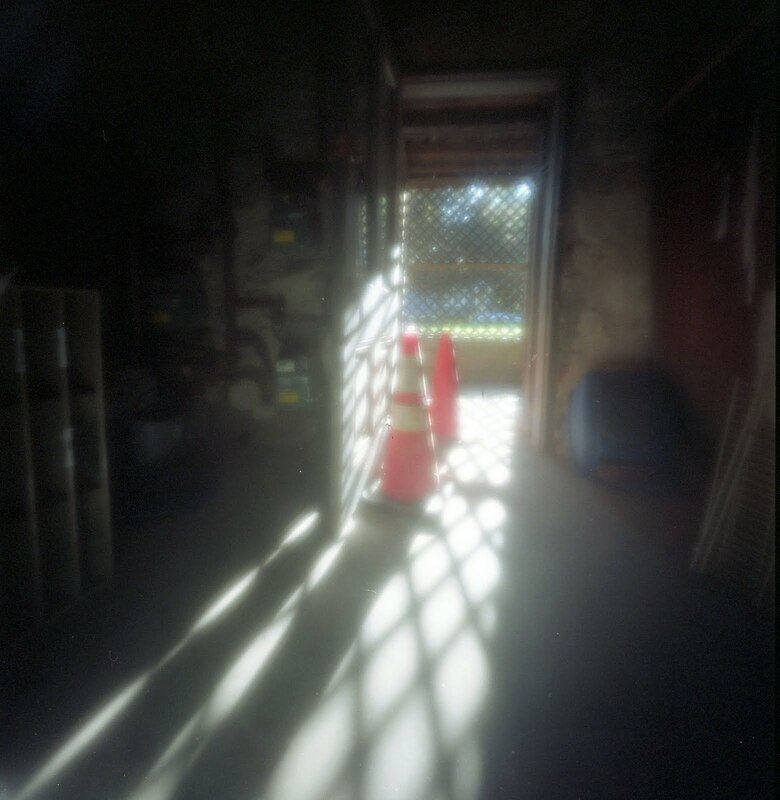 I finished and then developed this morning a test roll with the Zero Image 4x5 pinhole camera. 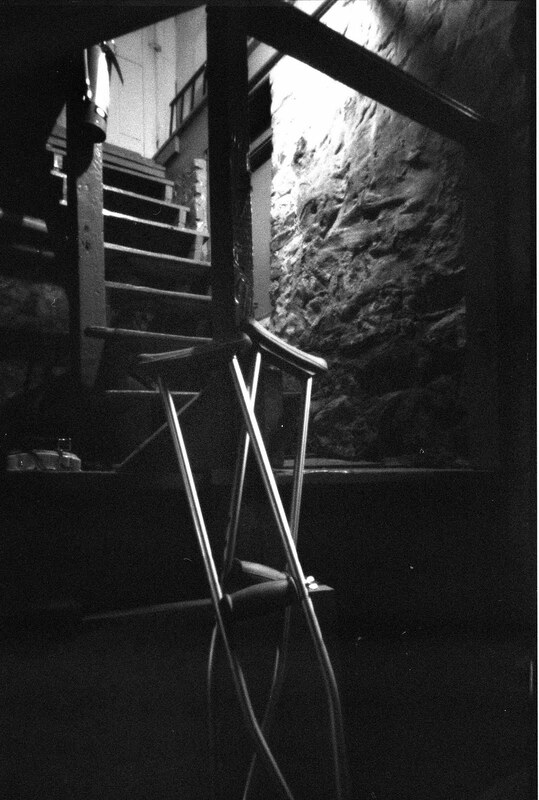 Well, strictly speaking this was not the first roll I'd put through the camera nor was it the second, but it was the first roll of Ilford Delta 3200 speed film I put through the camera while using two extension frames, making for a 50mm focal length and f/176. It was also the first time I tried shooting with the 6x9 frame on the roll back. My initial test rolls with this camera (I did a test with the 25mm pinhole and with the 25mm zone plate) did not result in images I was at all happy with. Part of the problem with those tests was that I had selected, in one case, the wrong type of film (color with the zone plate), and in the other case, the wrong speed of film (100--not good for the b/w indoor shots). 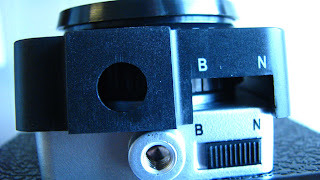 The other problem I experienced had, perhaps, to do with the 6x6 mask for the roll back. 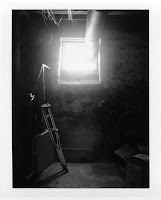 My sense was that pictures often overlapped or at the very least there were odd light leak-looking overlaps frame to frame. 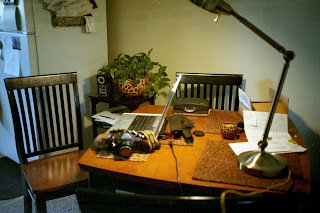 To ensure that I didn't experience that again, I switched to the bigger, 6x9 mask and took care to replace the roll back's metal film shield between exposures. Oh yeah--and this: I also just crossed my fingers. Having learned the hard way that the higher speed films aren't quite as high as one might think (and with it still being the case that the whole pushing/pulling film thing still has me confounded), I metered everything at 1600 with my digital camera and doubled most times to account for reciprocity error/correction. The images appear below in the order in which I took the shots--the first 5 were taken yesterday mid-afternoon and the last three were taken this morning at about 8:45. Again, since I've not yet gotten around to mixing up a new batch of Diafine and since I really don't trust the (very old) liter of Microphen I have here, I decided to do a Rodinal stand. This allowed me to write while the film cooked. Below each image appears the time of the exposure along with the f-stop and shutter speed taken from the digital camera. Again, exposure times were at least doubled in most cases. . . .oh yeah. and clearly, my obsession with the crutches rages on. and now for something much more labor intensive. . . In an earlier post, I talked about how the urge to take images with the Polaroid comes upon me sometimes. Well, I've definitely been in an infrared mood of late. Actually, ever since I found the main entrance to Patapsco Valley State Park (read: the side with plenty of parking), I've been eager to go back there with my tripod and a camera (or two) loaded with infrared film. The recent Holga hang-up has delayed my plans with this. And, to be fair, the heat too has been a contributing factor--it's been soooo hot here for the past couple week. The thought of tromping around the park with all that gear, well, not particularly inviting. Still, having done a lot of fast work lately (i.e., digital, point and shoot, polaroids), I was kinda in the mood to do some images that require more prep time, exposure time and/or patience. To my mind, infrared requires the most time and patience--at least in terms of metering, focusing, setting up the shot, making sure the i/r filter is back in place, etc. 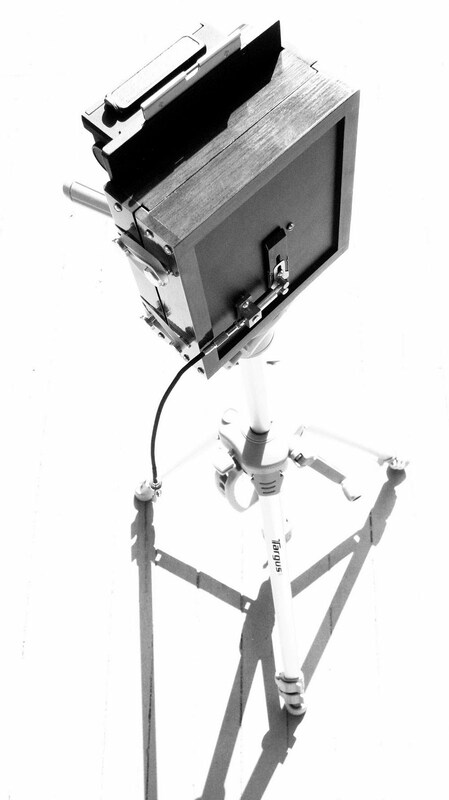 Second to that--taking images with the pinhole. Since writing wasn't going all that swimmingly yesterday, I decided to stop that before I got too frustrated. 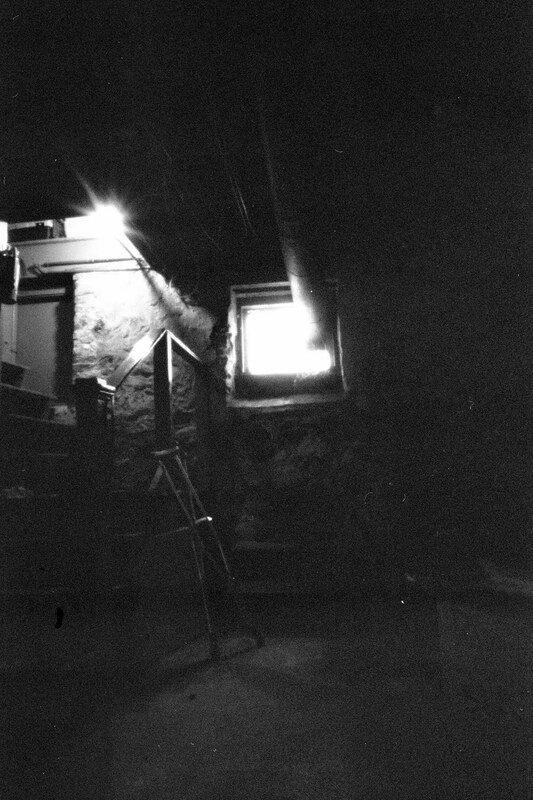 I loaded the zero image 4x5 with ilford delta 3200 speed film and headed to the basement. 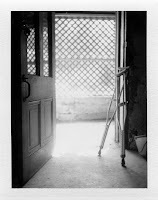 (I'm seriously worried that someone will be taking the crutches so I want to make sure I get as many images as I can in the meantime.) I'm still basically winging it with this camera. 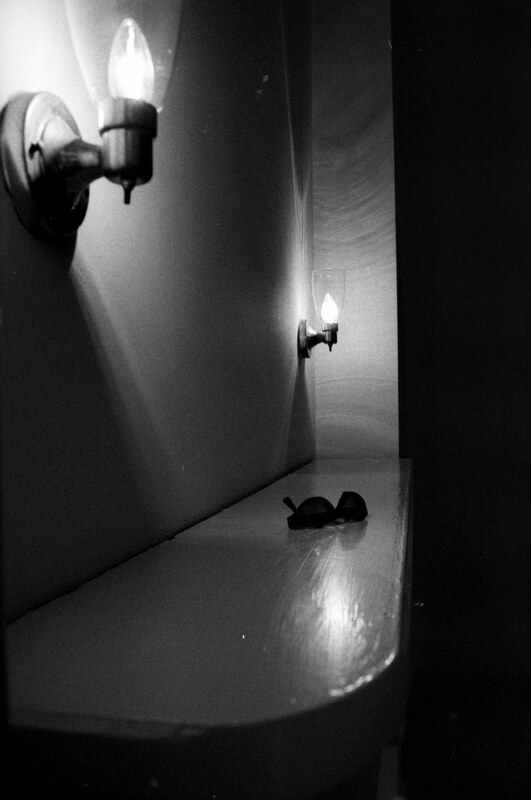 I decided to use the 6x9 frame this time and I metered each shot at 1600, doubling the length of each exposure with a mind toward reciprocity error/correction. We'll see. 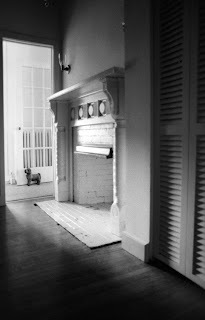 I took 5 interior shots yesterday which leaves me with 3 frames for today. I definitely wanted to get one (or two) of the basement door in the morning light (at this point in the season, the light is best between 8-9 am). I've still not mixed a new batch of Diafine. Being so close to the move date, well, it just doesn't make sense to mix anything I'll have to move. 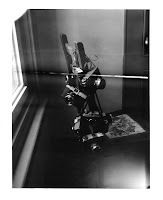 I'm not sure then if I'll do a Rodinal stand with this film or if I'll use some HC-110. I guess it all depends on how well the writing is going. 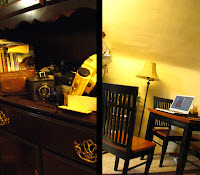 I prefer doing stand developing on writing days because I can sit here and write while the film is doing its thing. 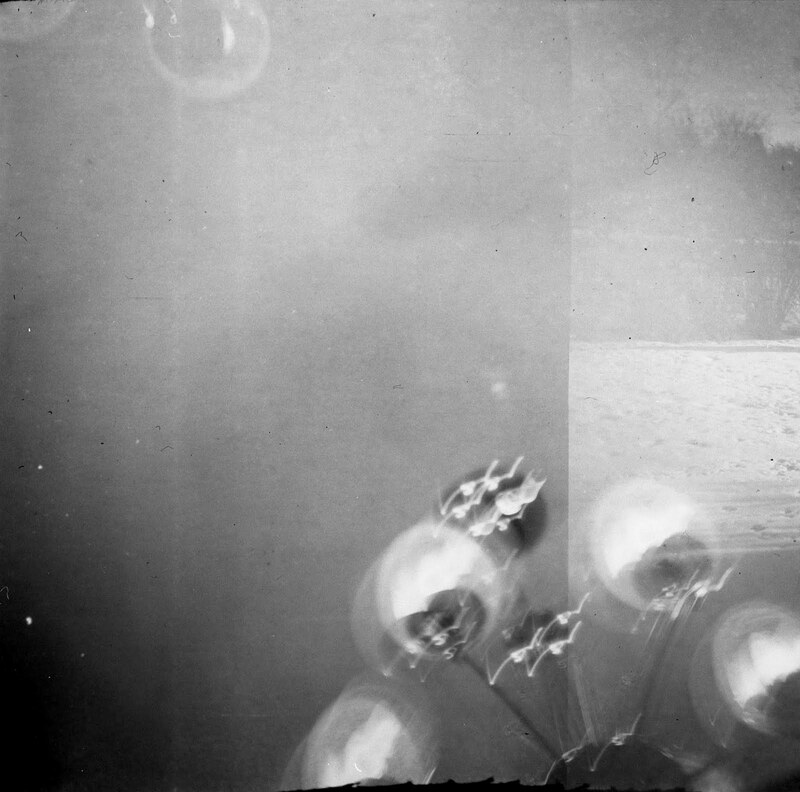 Too bad I'm so afraid of my reels getting too gummed up--I am actually kinda sorta increasingly in the mood to do some caffenol development. Hmmmm. Nah. Probably not a wise choice when I'm trying to get a handle on working with this camera and gauging proper exposure times. The documentary on Alfred Stieglitz (titled The Eloquent Eye) should arrive later today. I'm eager to see it and especially hoping that this documentary will mention something I heard in another documentary. If I recall, Stieglitz had expressed something along the lines of how he would be content if he was only known for (or if all of his work that survived) was one particular image. I believe that image was "The Steerage" but I am hoping to double-check or confirm that later today when I view The Eloquent Eye. 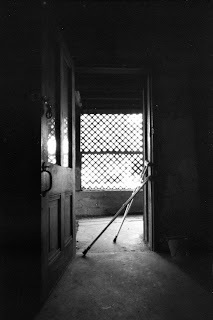 The idea (or question) of being known or remembered for one image--especially when one has amassed a sizable body of work--is a compelling one and I wish that every photographer (famous or no) had to answer this question: If you could only be remembered or survived by a single image, what would that one be? I imagine this would be kind of like asking someone what their favorite song is--or, as a variation on this: If you were going to a deserted island and could only bring with one album (or cd) which would it be? Otherwise put, I'm guessing the response from many would be "it all depends." And, certainly, for me, for a photo hobbyist, it seems silly to think about being remembered for one image. 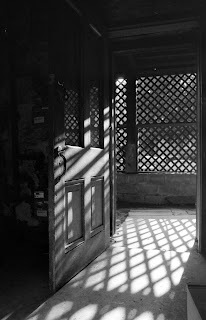 The idea of being remembered, is I think, a question for professional photographers or hobbyists whose work gets a lot of play--whose work has been widely viewed, known and subsequently re-viewed. A variation on this question--a question for the hobbyist whose work has not gotten a lot of play then might be: Considering all the images you have taken, which one most often comes to mind? This is not necessarily a question about personal favorites--meaning that an image comes to mind because it was a favorite or represented some kind of milestone, but it certainly could be interpreted and responded to in this way. In many respects, I think this is a much easier question to answer for (or on behalf of) other people. 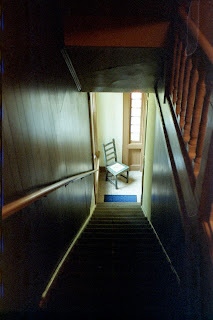 For instance, there are a number of photos I've made favorites on flickr and that I revisit quite often. (As an aside, I think this is the greatest compliment you can offer someone--to share with them the fact that you first saw their photo a month or year or whatever ago and that you still feel the need to go back and view it again and again--another way of saying that just seeing the image once is never enough.) When I revisit these favorite photos on flickr, my first response is often (and selfishly), "wow, I'm so glad that I didn't take that image because I think I'd always be worried that I'd never be able to top myself and take another that is as or more amazing." When I think about my own work, the "Panda woes" image below almost always comes to mind. I'm not sure why though I can always invent reasons or justifications, I suppose. I could say that it means a lot to me because it was taken with the Diana+ and we can't ever count on working (or playing) well together. Or I could say that I often feel like this panda. Or whatever. And just to be clear: I'm not suggesting that this my favorite image of those I've taken. If I were, I would have phrased the initial question differently. I'm just saying that of all the pictures I have taken, I tend to think about this one the most. Or, put otherwise, I tend to think about this one the most consistently. Meaning that while I may go through phases when I'm thinking about or dwelling on other images for x-amount of time, I always come back to this one at some point to this one. Again, not really sure why. Maybe because it upsets me? Makes me sad? 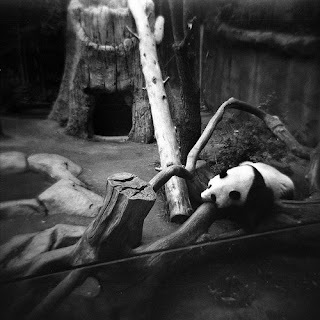 Maybe because I like how the black and white of the panda's body contrasts with the grays of the environment? I don't know. Usually when I really like an image it is because it does, in fact, represent some kind of milestone for me--trying a new idea or technique or camera and being surprised (whether happily or not) with the results. The other kind of photo/experience/moment I have a real fondness for has to do with the times when you see a picture, take the picture and get this feeling inside that it will turn out really great. The times when what you see with your eye and through the viewfinder (or on lcd screen) ends up being just as wonderful when you view the final product. This was not the case with the panda shot. I remember this day clearly--there was a long line of people shuffling through the exhibit. I think I had with me 3-4 cameras and I just grabbed whatever and took as many pictures as I could. I didn't think "oh--the panda looks so sad, let me get my diana since it's loaded with b/w film." I really didn't think anything other than (perhaps) how I'm not really a fan of taking pictures at a zoo. Seriously. 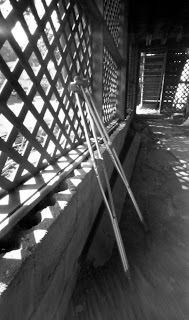 If someone takes (or worse yet, throws away) these crutches, I'll be heartbroken. This is the positive of the latest interior shot and featured below is a triptych of the positive image and two gooped versions (a b/w scan and a color scan) of the negative. 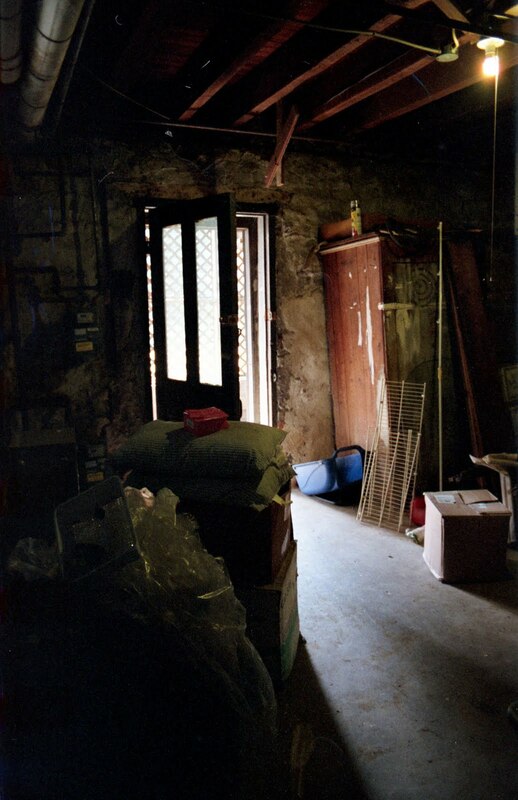 After waiting (get this) ten frigging days for my new Holga 120N to arrive (from NY, I might add--wtf? ), I see that the shutter release adapter I ordered with my first Holga will not fit on this camera. My plan was (and still is) to have a Holga that I will only use for shooting infrared film, hence the reason I was counting on the shutter release adapter to fit this new camera. So here's my work around. Not wanting to spend the 16 bucks to see if the shutter release adapter has been redesigned (i.e., if it has not been and I want to return the piece, I have to pay for the return shipping), I decided to return the 120N that arrived today (I don't have to pay return shipping for this) and ordered another Holgawood version of the 120N as the Holgawoods all appear (again, based on the online images there) to have the decentered tripod mount. I know my yellow one does anyway. So fingers crossed that the images don't lie. As an aside, I did try, however briefly, researching this incompatibility problem online. I did a google search and then searched within flickr specifically. Nothing. Which is odd. Normally if I'm experiencing some photo oddity, there are at least 2-3 others experiencing the same or something very similar. 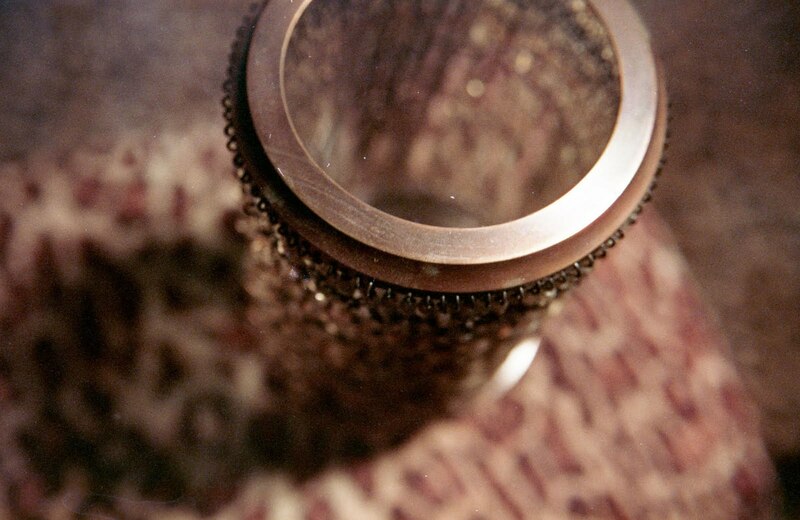 I mean, I think back now to my problem with the dead spider in the practika viewfinder. Though it didn't help resolve my problem (the dead spider is still there), I felt less alone when another person reported having the same problem. i blame the incredible Sally Mann for forcing me into my latest photo rut. to be fair, i also credit her for helping me out of it. to explain: way back when, when i began writing fiction, a very wise man told me to read everything i could get my hands on. and i did. i read a lot. actually, i read like there was no tomorrow. as for my production and my willingness to experiment, to take risks, to make it up as i went along? it seems all of this and more tanked. "why bother?" i thought. so many wonderful things have already been done, why not just experience (and by way of this, celebrate) all that greatness? in short, playing around, discovering what might be possible just seemed a heck of a lot less fun after reading so many greats. i should have learned my lesson then. but i didn't. and so, having become increasingly bothered (and i say "bothered" because to say that i felt "ashamed" is too strong a statement) by my lack of knowledge about other photographers and/or famous photos, i recently began reading books and renting documentaries about photography in general and famous photographers/photographs in particular. holy smokes! wowsa. all i can say is about the experience of watching the documentary and seeing a sampling of her work is this: there are times when i'm glad to have eyes and there are times when i am really, really, really glad to have eyes. again. holy smokes! after i finished viewing the documentary (and admittedly, there were portions of the documentary that while i could still listen to them, i definitely couldn't watch them. . . not, anyway, after learning of one of the ways the title term "remains" was being used in the film--if you are squeamish about death, corpses and decay, beware!) --but i digress. anyhoot. after i finished viewing the documentary, i remember thinking, once again, "why bother?" i would just as soon look at and think about her work (well most of it, anyway) for the rest of my life. and don't even get me started on her camera and her process. wowsa. the rut began. but then. as i thought more about her work and its potential for both teaching and inspiring photo hobbyists like myself, what i was most drawn to was her use of (dare i say "command of"?) light. i've always been drawn to well-lit scenes but what she is able to capture, her sense of light play--it's just amazing. i recall at one point in the documentary, she talks about the importance of just getting out there, setting up the camera and just taking another picture. how this is crucial in terms of getting her going again after finishing a series or show. this i think is another incredible lesson she has to share with photo hobbyists. to not let the last success or other people's success keep you from getting out there, setting things up and seeing where it goes. since i'm readying to move to a new place that has much better light play (or light potential) than my place currently does, i decided to play around a bit with the lighting (as well as the light fixtures) in those spaces. 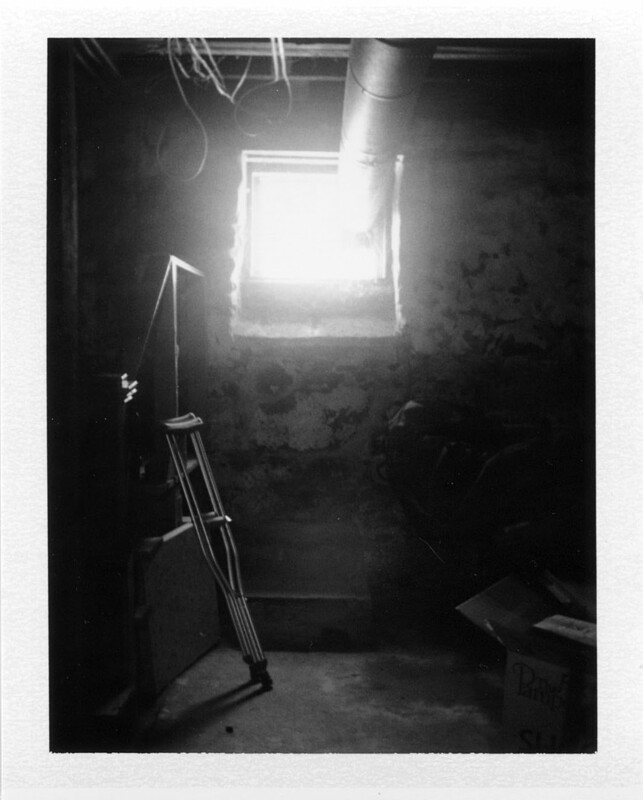 shooting b/w for this seemed to make the most sense (especially after experiencing Mann's work) so i got out my polaroid 220 and my canon ae1 program and started a series of interiors, a sampling of which appears above and below. i don't normally think about taking photos in terms of themes or series (usually, for me, what the photos all have to do with is testing a new camera or documenting a vacation, trip or outing), but this too was something Mann's work reminded me was certainly possible to do, to think about, to play around with. I finally got around to finishing up the test roll in the Kalimar Spirit SP pano trashcam the other day. I was definitely not impressed. Then again, a pano trashcam has a lot to live up to given my experience (and satisfaction with) what is to my mind one of the best cameras (whether pano, trashcam or no) ever made--the ultronic panoramic. 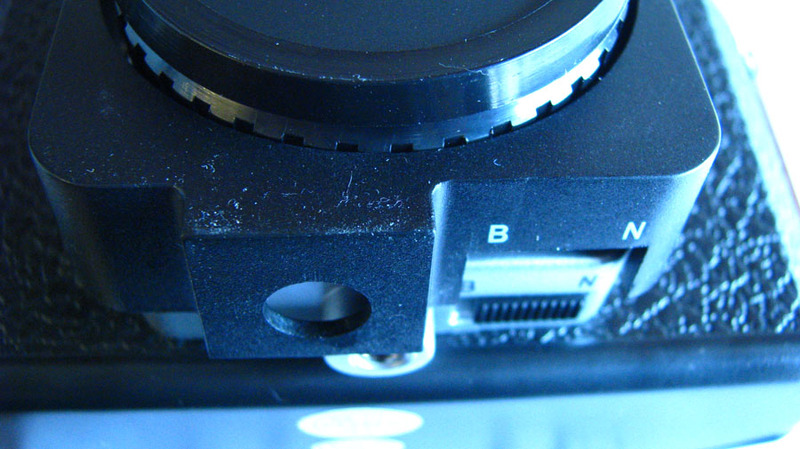 What follows could be viewed as an unfair comparison given the type of image chosen to represent each camera. 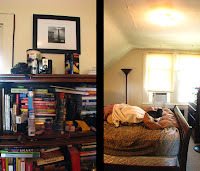 Here is a diptych featured an ultronic image to the left, and one taken by the Kalimar to the right. The image left, by the by, is one of my favorite all time images. What may seem unfair here is that the ultronic image is taken from a much closer distance than the other. I guess the best evidence I have of the ultronic's greatness has to do with the fact that of the 24 or so images taken on the Kalimar, only six were worth scanning in. This is never the case with the ultronic. 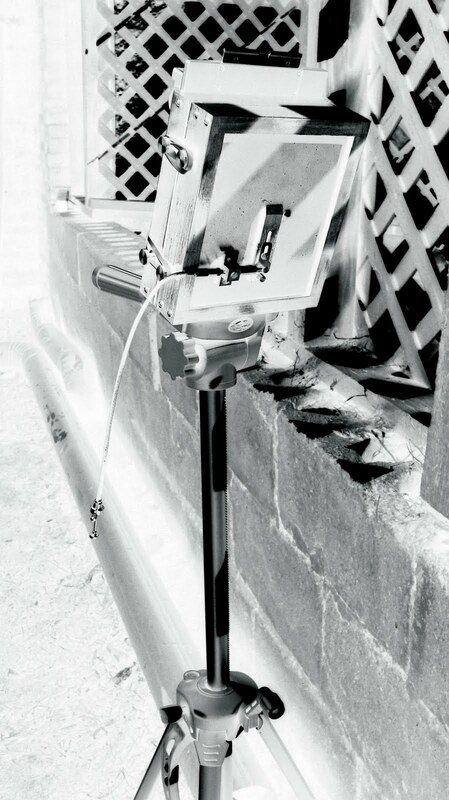 With this pairing the Kalimar image is positioned above the one taken with the ultronic. This was perhaps my favorite Kalimar image. The ultronic image featured here is okay--not one of my favorites. 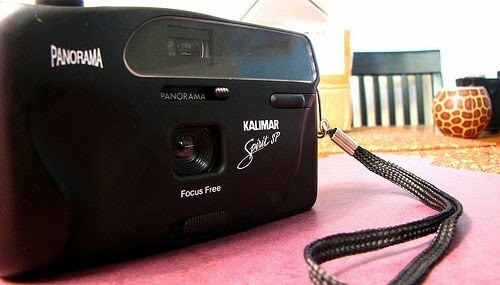 My main problem with the Kalimar has to do with the way the images looked once developed. With the exception of the boat pic above, the colors were all blah--something that is represented moreso in the first image featured here. The colors from the ultronic have always been incredible. I don't know if this has to do with the camera, the developer or something else. [Note: I used fuji 400 in the Kalimar--a film and speed I often use in the ultronic.] I will say that when I developed the Kalimar images, the developer was very new. This is not to say that the developer wasn't compromised though by the c-22 debacle from last week. I refer now to trying to develop film meant for c-22 processing in c-41 chemicals. If the developer has been compromised to any degree, it's clearly not ruined. The colors are still okay, accurate enough, etc. I guess I'll try developing another not-so-important roll of film and see what's what before deciding to dump this liter. I did do a number of close-up shots with the Kalimar, but they were hardly worth scanning or saving. What I find particularly remarkable about the ultronic is the depth of field--how everything, whether close-up or at a distance, is in focus. My sense was that the Kalimar was not as capable of doing this. It lacked a certain sharpness, attention to detail. I'm not ruling the Kalimar out all together. All I'm saying at this point, is that it won't displace or even threaten the ultronic's position as my number one pano go-to camera. Perhaps I will do another test roll when I change out the chemicals. I think it would be most helpful, in terms of comparing the cameras, to take both cameras out on the same day and shoot the same subjects or scenes with each camera. That way, I will not be comparing images shot on a dreary day with ones shot on a better day. As researcher, I should know this: Keep track of your stuff, know where stuff is, know what you do and do not have, what's yet to be done, etc. 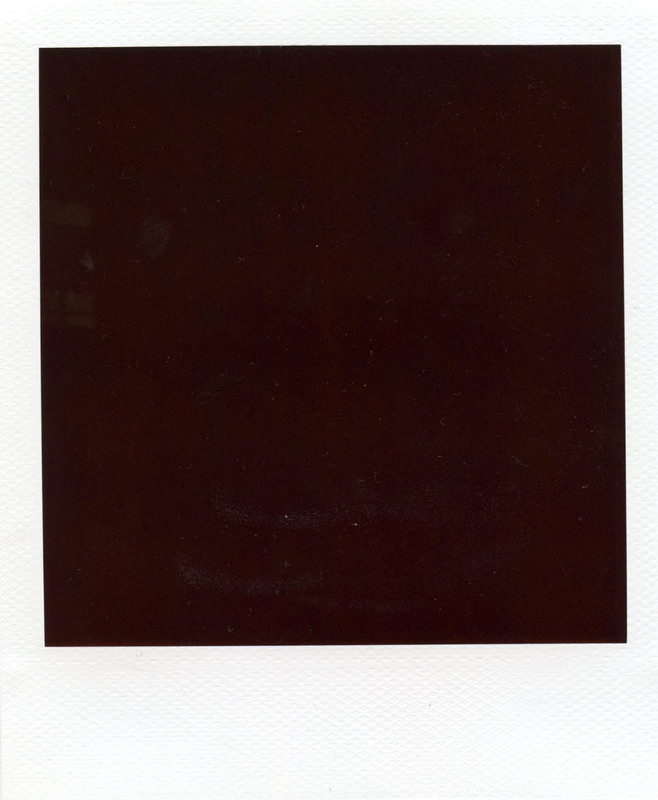 I end up spending a week or so working with a Polaroid that I assume is the 220. In fact, I've put images into sets and tagged things on flickr based on that understanding. 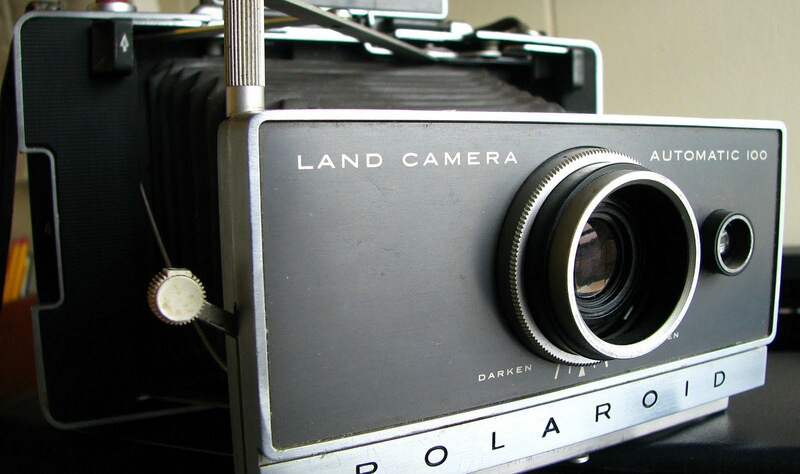 I'm in the middle of packing to move and as I was going through a cabinet of cameras, I come across another Land Camera. I'm puzzled because I know I have a broken 225 that I began modify to be a wax paper film plane camera, but I know this isn't it. The modified 225 looks much different and I know that's in another closet. So I open up the recently found camera and it's the 220. Turns out I had been working with the 100. Hmmm. The kicker is that I don't remember buying this. I vaguely remember waiting for a second battery to arrive, but I thought maybe I was just ordering a spare to carrying with me for when I'm at antique or resale stores. Moving has been a really good excuse (or incentive) to start an inventory of what I have. I'm not at the point (not yet anyway) where I've accidentally purchased a camera that I already have but I can see things going that way at some point. Of course, I've often purposely bought a second (or third or fourth) camera that I already own because I've wanted to make sure that if anything happens to the first one, I'm covered. Lately, I've been fortunate enough to have been given some fun photo assignments courtesy of a facebook friend. 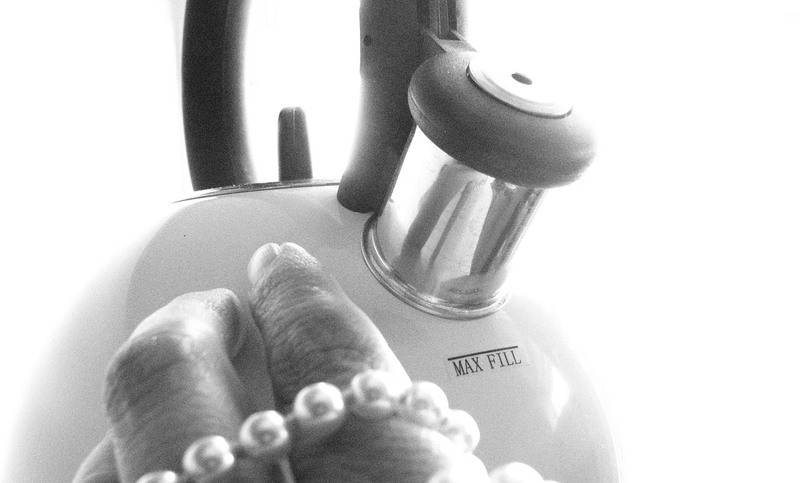 The first challenge or assignment (represented by the image left called "max fill") was called "jody was here" and entailed me finding ways to get something (a finger, a foot, a shoe, a braid) into an image of something else. This was much harder that I thought it would be as it was difficult not to let the body part dominate or become the main focus of the photo. Yesterday's assignment or challenge--one I've named "opposing views" was one that I didn't know that I'd really get into. By contrast, I thought the first challenge would be one for which and with which I'd come up with many things to do. Wasn't the case. Anyhoot. 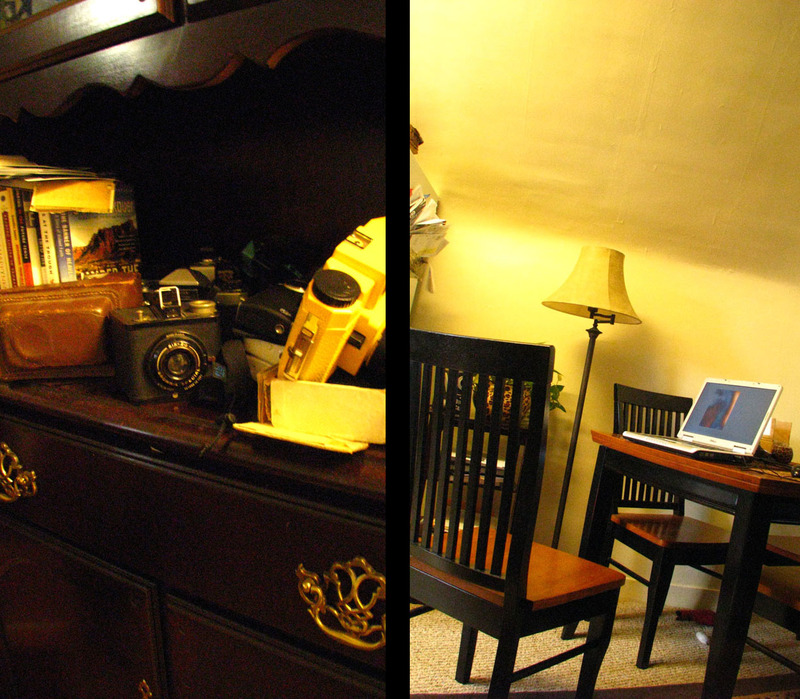 This time the assignment was to take pictures of what my cameras might see at various times throughout the day--specifically so, the cameras that are sitting on shelves, tables or left hanging on chairs or doorknobs. 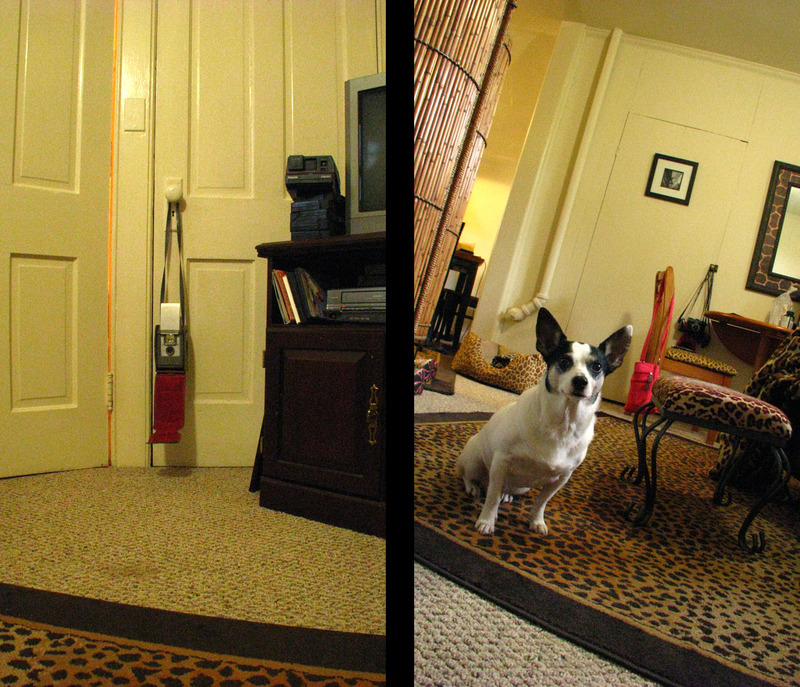 In the diptychs featured here, the image to the left depicts the camera and where it is positioned while the image right depicts what that camera might see. 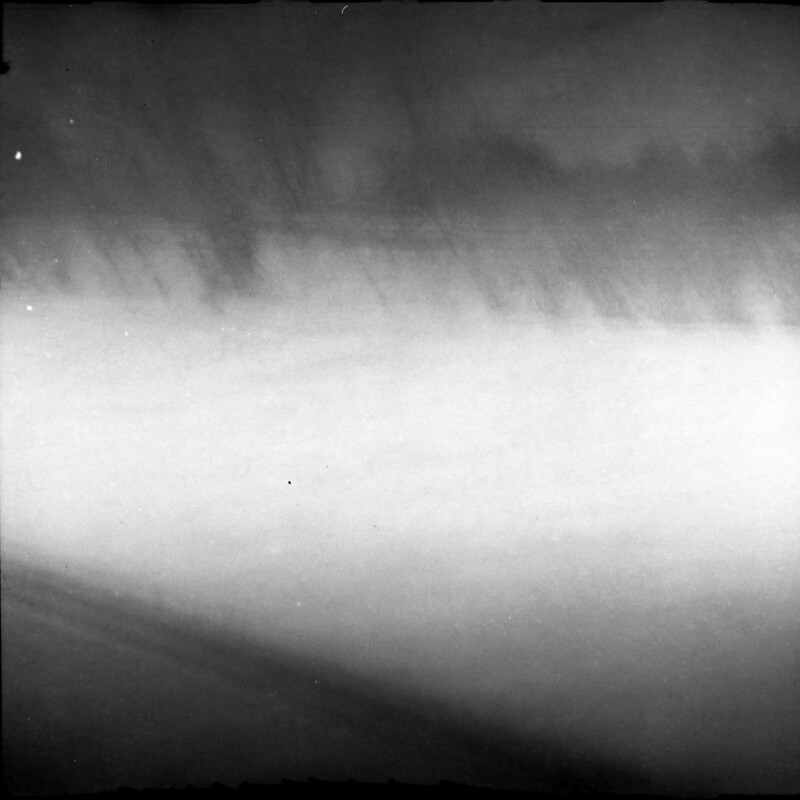 This first image is what the ansco anscoflex sees and as you will soon see, Dorothy figures prominently is a good number of shots. . . .and here what the brownie hawkeye flash (modified as a wax film plane camera) sees. The Wirgin Junior folding camera arrived today. By the by, there's not a heck of a lot out there on this camera, though one site incorrectly refers to it as a 6x9 120 camera. It's not. It takes 6x6 shots. . . .a portion of which I'm really quite fond. and this too. definitely a more abstract-y version of the snow and tree line above. and then there was one other image on the roll--a really uninteresting image of a squirrel sitting in snow. Problem was, the squirrel was so small and the snowy landscape so ginormous you had to magnify the image a lot to figure out the speck on the snow is, in fact, a squirrel. But that was it. Nothing else on the film. Boo. Not the best couple of weeks (or has it been months?) for me where making pictures has been concerned. So the second Diana 151 arrives the other day (I highly recommend bidding on items during holidays) and the surprise bonus is that there is a roll of film inside. The roll is on exposure #2 and I'm a little bummed because it would have been great to get the mint diana, the box (in what I'd call good condition as there is a small tear starting in one corner of the box) AND a fully exposed roll of film for 19.95. Here's where I messed things up and why I'm ultra-bummed today: While I've researched how to go about developing old b/w films, it never occurred to me to do the same with color films. Maybe part of this is that my experience using the Tetenal C-41 kit has me on auto-pilot in that I develop every color film for the same amount of time, no matter what. Another (more embarrassing) part of the problem is my not even stopping to think that anything preceded C-41 development. Blast! Double-duh! 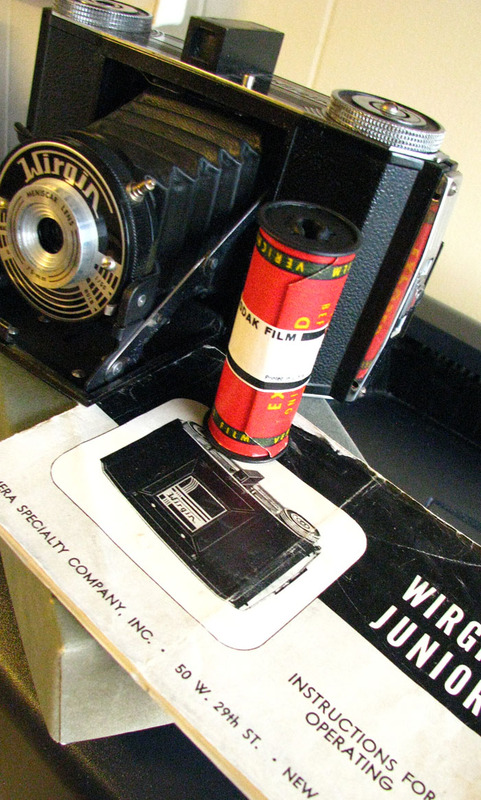 The roll of film inside was Kodacolor-X, a film that used C-22 processing. 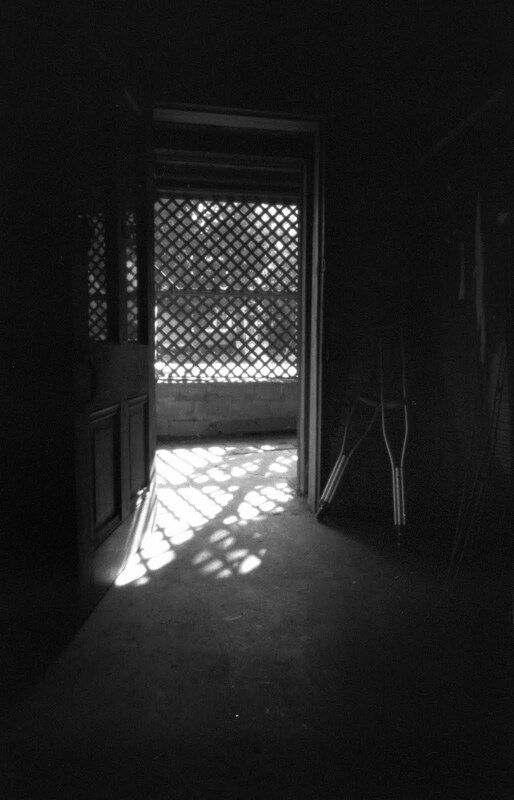 I read on one forum that a b/w developer like Diafine or Rodinal can work, but obviously, it's too late to try that with this roll. It was, needless to say, fried after its bout in C41 chemicals. Seriously, yellow stuff was dripping off the roll. So sad. Such a learning opportunity missed. Of course, this is not to diminish the much harder lesson learned today: Research everything first--don't assume! That said, I would have rather learned more about what this particular film could do. The one thing I give thanks for is that they were all (save for the first frame) all images I took. And having no idea if the camera back had been off or if the film had been exposed to light, I didn't shoot anything that couldn't be shot again. Still, the sky today was amazing. Blah. I guess I always know when it's time to get back to the job I'm paid to do and leave the hobby aside for a bit. . .between this gaff and the polaroid woes, I feel like someone or something is telling me to get back to work. Once upon a time I took a picture of a garbage can on campus. Of interest to me was the fact that whomever attempted to use the can prior to my walking past it had failed to hit the mark. 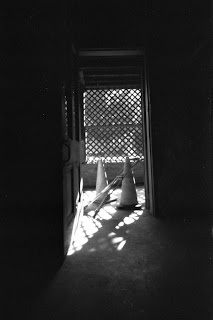 On the top of the can, inches away from the hole into which trash is normally thrown was a half-melted ice cream cone. I suppose I was attempting to capture the carelessness of the user or maybe I was interested in capturing something that was not quite completely in its liquid state. I would have posted the picture here but I don't know that I considered it worth keeping, so I've subbed this other one in for it since this photo (taken with the Yashica D, the image was part of a project documenting a student project that involved them doing a parody of a cooking show) gets to the topic I want to address here: photographing food. So I understand taking photographs of food for recipe books, online recipes or for covers of cooking magazines. I understand too the instructive/illustrative value of seeing an image of what one is trying to make, cook, bake, etc. What I don't get are all those pictures (many of which are really crappy and often times flash-assisted) of things people are about to it, want to eat, have partly eaten, can't finish. Don't get me wrong, I love food and I don't mind looking at it, thinking about it, writing about, etc. In fact, long, long ago I had plans to write a dissertation on cookbooks. 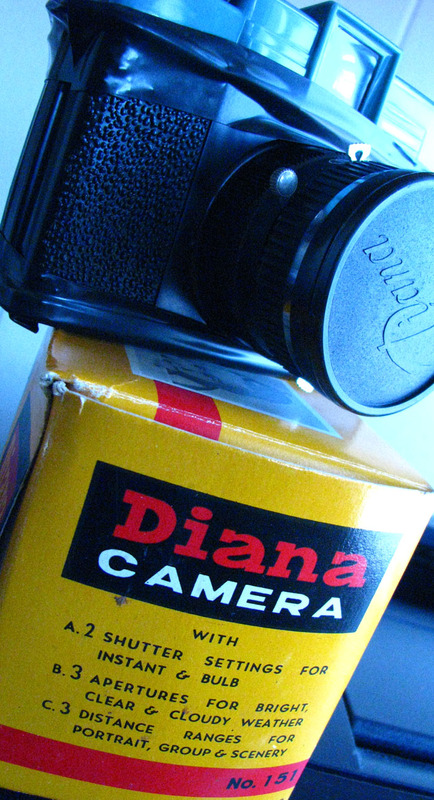 I just don't understand the practice of photographing what you are about to it--diary-style, with a cell-phone. 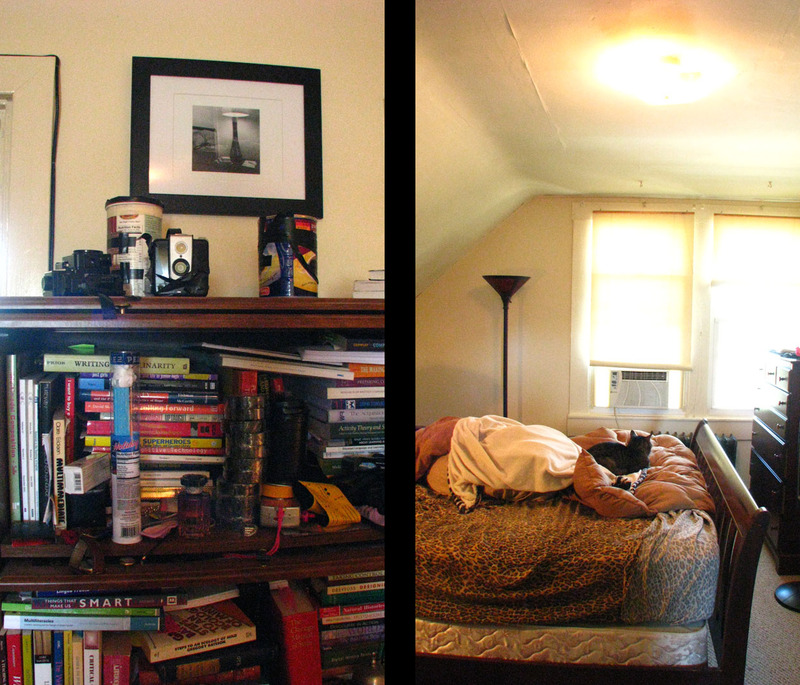 But maybe, in the end, it's mainly the quality, composition and color of most of the photos that I object to. I mean, it seems like a lot of meat eaters like to take pics of their meals and everything just seems like lumpy, brown gravy on a plate. What's got me thinking about the food issue lately is that I've been researching the Pentax K-x, trying to come up with reasons why I don't want to buy this camera. The researching and review-reading has been fun and easy. Trying to talk myself out of wanting this camera has been the tough part. The best reason I can come up with for not buying the camera ultimately feels to me like a reason to buy the camera. I begin by acknowledging that the last thing I need is another camera. 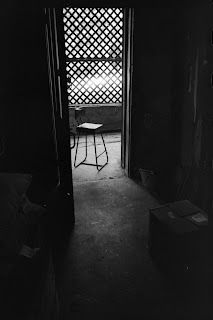 I go on to reason, however, that I certainly don't need a new film camera and that if I ended up getting another camera, I would need a new digital camera more than I'd need another new film camera. In the end, all I'm really saying here (I think) is that I don't need another film camera--any discussion about needing or not needing another digital camera kind of falls by the way side. This said, I'm assuming that if I were, once again, back to flirting with the idea of purchasing my all-time dream camera, the Kiev 88, what I'd be saying about types of cameras would be reversed. But I digress. So I'm reading yet another review of the Pentax K-x and I learn that one of it's featured scene modes is for food. sigh. Maybe having a dedicated mode for it will make the pictures look better? I just don't get it. The photographing food thing, I mean. The jury is still out on whether I'll ultimately end up just getting the K-x. Before getting to the pola woes, I'd like to say something about pola desire. 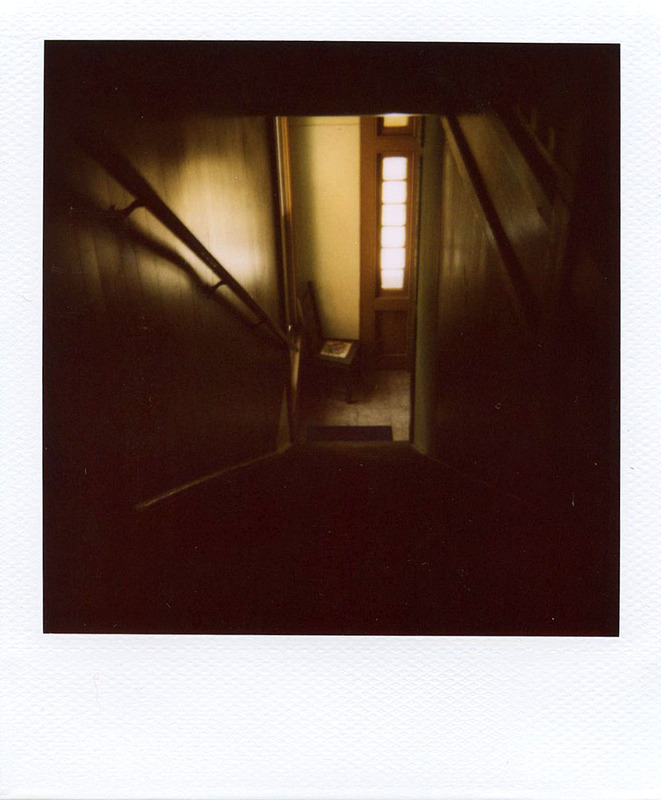 More specifically, the desire to take polaroids. For me, the desire to work with polaroid cameras--though I don't have the urge that often--is much like the desire to develop film. 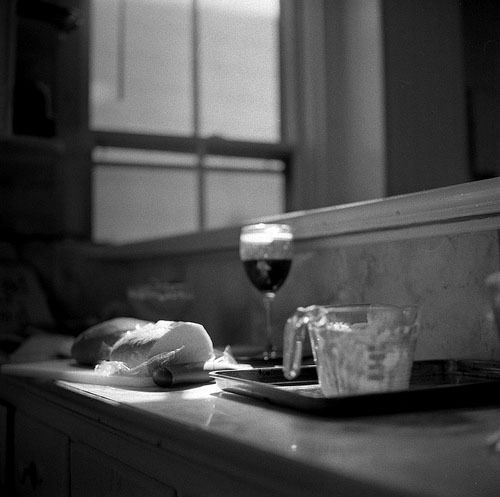 When I'm wanting to develop film, I don't care if the pictures are good, I don't care if there is anything I necessarily want to photograph and maybe I'm not even in the mood to take pictures, but I want (it actually feels more like a need) to go through the development process. I want to measure, agitate--I want to smell the fixer, wait through the long rinse process and then clip and hang the negatives to dry. 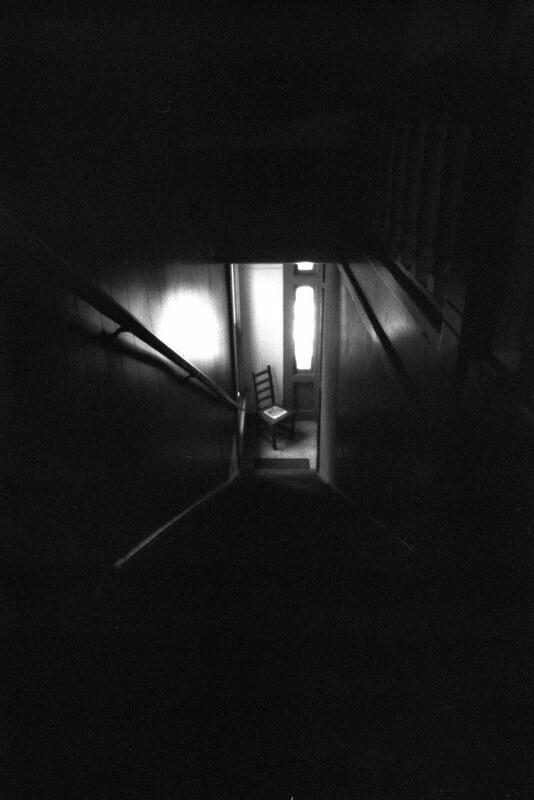 So I was having the pola urge earlier this week and since I really wanted to document the back stair case before I move, well, it seemed like the perfect time (and given the dramatic lighting at the bottom of the stairs, the perfect camera with which) to do so. 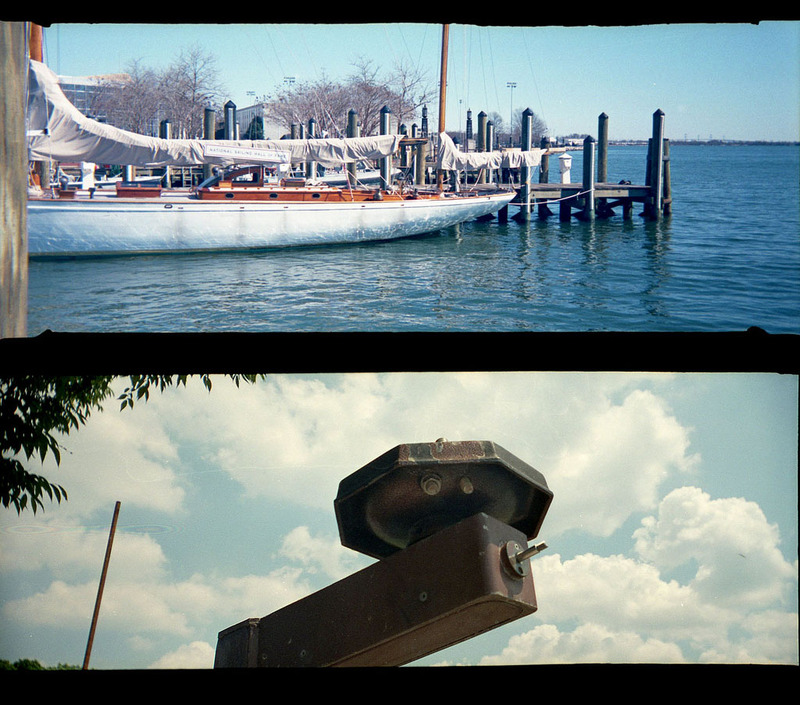 So I take a few shots with the One Step Close-Up using expired 600 integral film (see first image above) and then I decide to take out the Polaroid 220 and take a few more images using Fuji b/w 3000 pull-apart film (see triptych directly above). No question: I'm definitely having a goop ole' time so much so that I decide to try and sustain the pola fun through today. No bueno. Shoulda' quit while I was feeling ahead. And now for the pola woes part. As it happens, both cameras started misfiring with two exposures left in each camera. The 220 seemed to jam after (or while) taking this picture of the chair with the diana cameras strung over it. More specifically, when I pulled this image out of the camera, it came out followed by 1/2 of the final exposure left in the camera. This--the overlap--I'm guessing is responsible for the white line running through the image. 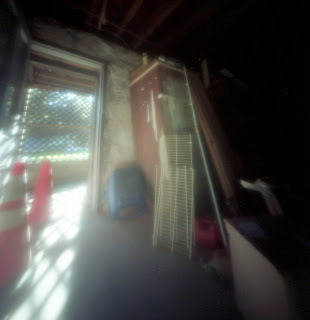 But there there was this: The two final exposures in the One Step came out like this. Blech. I believe I read something sometime ago about others having problems like this with both types of film--if I recall correctly, the problems occurred with the last shots in the film packs. Problem is, I don't recall exactly where I found those discussions. Mmmm. Guess tomorrow will involve some re-research.